Day 158 Oslo to Lillesand, Norway. We had a leisurely start this morning, whilst I tried, and eventually succeeded in retrieving my lost photos off the ‘cloud’. Besides, it was a damp cloudy morning, and having seen Oslo in the sunshine yesterday, we decided to continue onwards, with pleasant memories of the city. We were very surprised by the amount of traffic on the roads today. Being a Sunday, usually it is a good day for a long journey, but the density of traffic was unexpected, especially having become accustomed to the quiet roads in Iceland, Denmark and Sweden. The driving is a little more challenging for me too, with lots of tunnels, which I loathe, especially when they go on for kilometres at a time. Initially, we had intended just to travel a modest distance today, but having knocked a second visit into Oslo on the head, we changed our plans and headed further south towards Kristiansand. We made the error of picking the town of Sandefjord for our morning coffee. When we arrived, we discovered that they were hosting the National Cycle championships, and many of the roads were closed off for the peloton. Sandefjord was a former whaling port, and to commemorate this they have erected a rather fine fountain by the waterfront, called the Whaler’s Monument, where amid the spray emerges a slender row boat and it’s crew riding the wake of a large whale’s tail fluke. We saw little else of the town, sadly, but there appeared to be a pleasant park by the water, and I’m sure lovely vistas across the fjord. We continued on to a town called Grimstad, another harbour town lined with white weather-boarded houses, and at one time home to Ibsen, the playwright. We did not see it at it’s best, however, since by now the rain had set in. We checked out a campsite nearby, which although situated in a pleasant waterside spot, was deserted, and a quick scout of the wash block did not really appeal. In fact, it looked pretty grim (there’s a pun there!). A little further along the road we came to another campsite, which although did not have quite the same kerb appeal, had a pleasant lady at reception, spotless wash facilities and vacancies. 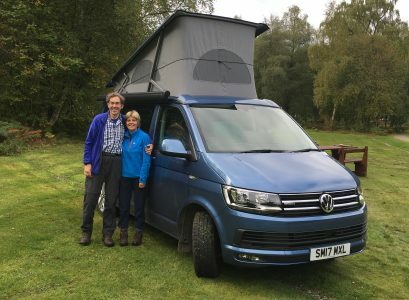 Most of the pitches were fairly average, lined up alongside each other, but the advantage of a small van, is that we can fit into small spaces. We eyed up a spot overlooking the fjord, which although not officially a pitch, was ample room for Oscar. Our lovely lady said it was fine to park there, and so I the end, we have a premier spot overlooking the water – very nice indeed. We celebrated by walking into the town of Lillesand, ten minutes or so away. By now, the rain had stopped and the evening sun had come out, casting a wonderful light across the harbour. The town itself is gorgeous, with mainly white weather-boarded houses, most with pretty well-tended little gardens, set around a picturesque harbour. We found a waterside cafe, and sat and had our supper looking out at the bobbing boats. We meandered back to the campsite via the town church, and an over-sized park bench, that Howard couldn’t resist sitting in. Being Father’s Day, all three boys had beamed in, so he was feeling pretty upbeat. It’s amazing what a little contact from home can do for your spirits on this long trip. It’s also good to have someone different to talk to! There are so many times that Howard and I open our mouths and start to say the same thing, I wonder that we don’t just give up talking to each other, and just communicate by telepathy. Tonight, we have a new shower system to master – key code, followed by card, to be inserted until shower starts and then removed immediately, else it debits you for two showers, but with the luxury of five minutes. We won’t know ourselves! Yet again – no photos yet. The campsite WiFi’s and 4G are failing me badly in Scandinavia. Ridiculously, it was easier to download the photos in Iceland – who would have thought?! Previous Post Day 157 Stromstad, Sweden to Oslo, Norway. Next Post Day 159 Lillesand to Stavanger, Norway.